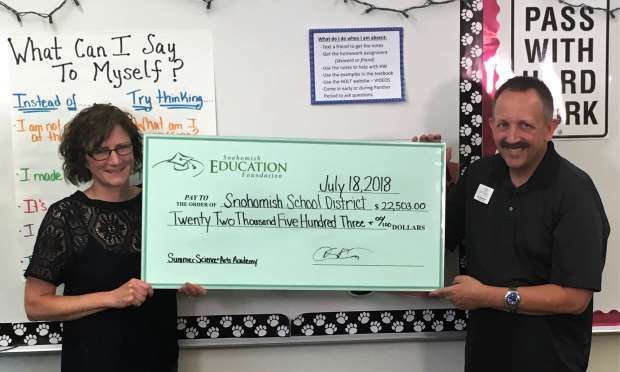 The Snohomish Education Foundation announced that through fundraising and community donations it has recently awarded $22,000 to the Snohomish School District Career and Technical Education Program and $22,503 to the Snohomish School District’s Summer Science and Arts Academy! The $22,000 donation focused on AP Computer Science, Tech X, and training six teachers for TEALS Computer Science instruction. 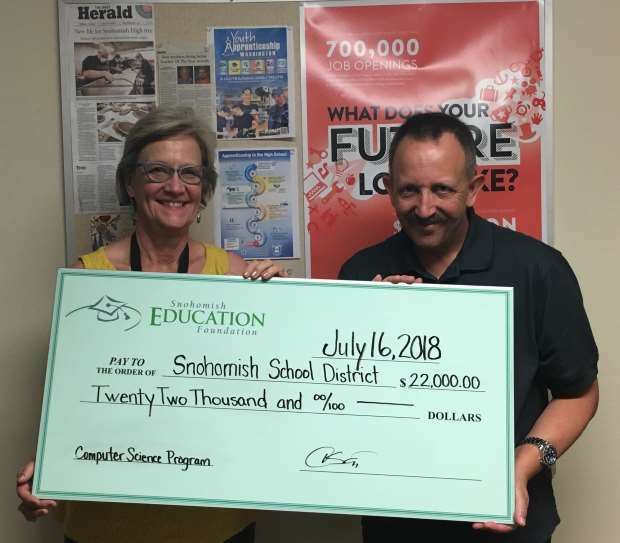 The donation has been part of a two-year annual fund goal totaling $42,000 to benefit the Computer Science Programs at Centennial Middle School, Valley View Middle School, Glacier Peak and Snohomish High School. “We have been so fortunate to partner with the Snohomish Education Foundation to provide the TEALS (Technology Education and Literacy in Schools) program and computer science training to our teachers and students. The skills learned in coding and computer science courses will translate into many careers in the workplace, even if the student does not pursue a computer science program,” said Deb Koenig, Director of Career and Technical Education for the Snohomish School District. Career and Technical Education (CTE) prepares students for life and a career after they graduate from high school. Apprenticeships, technical schools, community colleges, 4-year universities, and military service are options that can be discovered in these courses. Science, Technology, Engineering & Mathematics (STEM) concepts are taught, including a blend of technical, academic and trade skills. CTE courses offer college credit through tech-prep programs, college in the high school, or AP (advanced placement) courses. CTE blends STEM concepts and hands-on projects for students. The Snohomish School District offers 18 different pathways in their CTE programs. These different pathways to success can lead to college credit and/or industry certification. The pathway programs include: Agriculture & Science, Business & Marketing, Design & Manufacturing (Pre-Engineering), Family Consumer Science, Health Sciences, Information Technology (IT), and Visual Communications. For more information on the Snohomish School District CTE Program, click to www.sno.wednet.edu or call 360-563-7317. “The Science & Arts Academy has benefited immensely from the generosity of the Snohomish Education Foundation over the past few years. Their direct donation allows students to attend four weeks of Summer Academy at no cost. Many of these students would be at home with little exposure to enriching activities over the summer, whereas the academy offers them the opportunity to take field trips, design and create in the STEAM (Science, Technology, Engineering, Arts, Mathematics) & STEM (Science, Technology, Engineering, Mathematics) classes, put on a musical, build robots and so much more,” said Academy Director Philippa Farrell. The grant provided tuition waivers for academically struggling students from low-income families and students from English as a Second Language households. Since 2015, the Snohomish Education Foundation has funded over $92,000 to the Summer Science & Arts Academy. The summer academy recently concluded its ninth year at Snohomish High School with over 540 students enrolled from Kindergarten through 8th grade. With over 42 teachers, 23 para-educators, and 14 volunteers, the staff focused on filling the “summer slide” where many low-income students struggle to retain the previous year’s knowledge. As a result of the slide, they are further behind when school starts in the fall and are at risk of failing and ultimately dropping out of school. The summer academy gives students more choices, sparks their interest in learning, and “opens doors” that they may not have known existed. Students with special needs are encouraged and welcomed. Trained para-educators team with teachers to ensure that special needs students’ experiences are bolstering their academic skills. For more information about the Summer Science and Arts Academy, visit the Snohomish School District’s website at www.sno.wednet.edu. SBI, Boeing, Corstone Contractors, Community Transit, Coastal Community Bank, Beresford Company, Inquisitek, Koz Development, Ideal Communications, George Orthodontics, Centennial Family Dentistry, Chartwells, Kuslers Compounding Pharmacy, Mountain Pacific Bank, First Financial Northwest Bank, Haggard Electrical Contractors, Foster Pepper, McKinstry, Moss Adams, Heritage Bank, Skydive Snohomish, Snohomish Flying Service, Harvey Airfield & Chinook Lumber.